Winning Opportunities for Women – W.O.W. 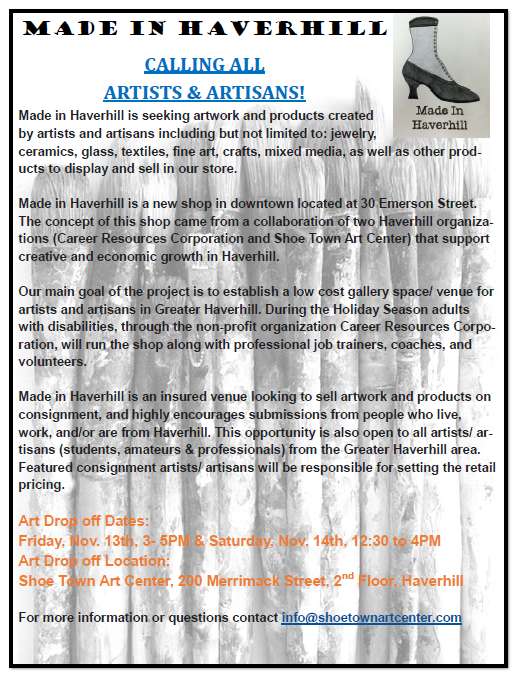 Career Resources Corporation (CRC) and Shoe Town Art Center are proud to announce the first ever Made in Haverhill pop-up holiday shop! The art studio will be open to the public on Monday November 30th with an open house to take place on December 2nd from 3:00 pm-6:00 pm. Made in Haverhill is a new shop in downtown located on 30 Emerson Street, Haverhill. The concept of the shop came from a collaboration of two Haverhill organizations that support creative and economic growth in Haverhill Massachusetts. The main goal of the project is to establish a low cost gallery space/ venue for artists and artisans in the Haverhill area. During the holiday season adults with disabilities, organized by the non-profit Career Resources Corporation, will run the shop along with professional job trainers, coaches, and volunteers. Made in Haverhill is an insured venue looking to sell artwork and products on consignment, and highly encourages submissions from people who live, work, and/or are from Haverhill. This opportunity is also open to all artists/ artisans (students, amateurs & professionals) from the Greater Haverhill area. “Since the beginning of our partnership with Shoe Town Art Center we’ve had tremendous success! We are excited to expand the collaboration into the community. Creating new expressive outlets and employment opportunities for people with disabilities is core to our mission.” said Career Resources CEO, Brad Howell. Since 1968, the non-profit Career Resources Corporation (CRC), has been assisting people with disabilities to live, work, and fully engage within their communities. Career Resources offers a wide range of support services to people with disabilities, including those with brain injuries and veterans of the armed forces. With the most helpful and appropriate services available, across 4 programs, CRC provides opportunities for people to become participating, involved and valued members of their communities. Employment Services provides vocational training services, job placement, and ongoing job support in the Merrimack Valley. Day Services offers customized goal-oriented programs that promote independence and community membership. Shared Living and Adult Family Care are options for people who prefer to live at home supported by their families, or in a family environment. Community Living Services are group residences (24/7) that provide a healthy and supportive living environment. For more details please visit our website, www.crc-mass.org or call 978-374-9122 to learn how you can be a part of Career Resources’ mission to erase limitations. Emily Lawrence-Boulger, the founder of Shoe Town Art Center, believes that every individual is a learner and that everyone has the ability to create. Being in the field of special education for many years, Emily has noticed there were not many after school opportunities for children and adults with disabilities. This is the primary reason why Emily was inspired to open Shoe Town Art Center. She wants a place for all people to feel welcome, regardless of their skill level or needs. Emily’s experience and advanced education allows her to work comfortably with students and support a variety of populations including individuals with intellectual, social-emotional and behavioral disabilities.